There are two enormously successful European designer-artists that I really admire. Today I'd like to share their work with you. Perhaps you have not come across them before. 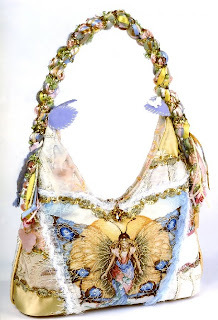 The other woman I admire is German fiber artist Ulrike Ay. 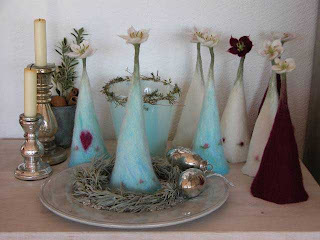 Also self-taught, she creates incredibly life-like felted flowers, decoration and accessories from high-grade wool and silks. Her work speaks for itself. It's really nice to see people in the handmade business make it to the top and stay there. I find this inspiring and it keeps me motivated! These are great, Duni. I agree with you that it is wonderful to see successful women in business whether it is handmade or in retail. I like to support a few the women-owned businesses in our town. It is easy because they do such a great job!! I cannot believe it is snowing here in my part of Texas! Those are very nice pieces and it's obvious the artists have something unique to bring to the table. I got caught up on your most recent posts and agree that 'cookie-cutter' handmade just isn't the same...what are they thinking! BTW, love the satchel you made! Good luck with your website! Amazing pieces of art !!! I have never heard of the artist but I LOVE the bag. Anything in fabric or textile is so stylish and a conversation piece. love the flowers. It looks like real. Wow, it's easy to see why they have maintained their "top" status. What talented artists. That first one I thought was a painting until I looked closer. And I LOVE the color palette of the felted flower artist. Amazing! Beautiful, but I especially love the last picture-- those flowers and vases are gorgeous! Those are all so pretty and like nothing I've seen before. What great talents! I have been given the Sunshine Award and I have decided to pass it onto you! I think the felted flowers are impressive. I would like to believe that handmade business could really be on the top and stay there.. Thanks for these beautiful motivation! Yes, our cats really do chase it. And chase it and chase it and chase it! The boy seems to think he can eat it though. It's pretty funny to watch him snip at a laser dot. Haha. Guess our kittens aren't as bright as Sammy! those flowers are amazing! and I love the "vases" they are contained in. I love the fact that these women are so successful.